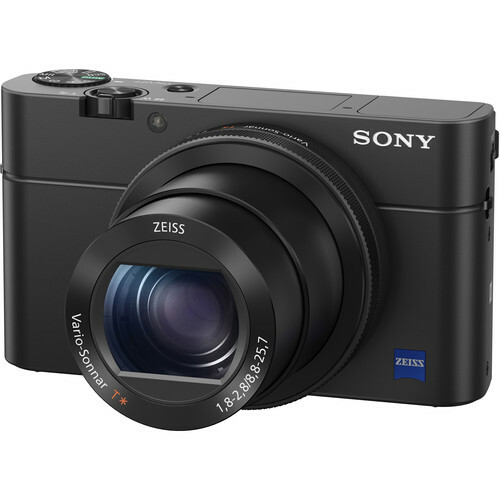 The Sony Cyber-shot DSC-RX100 IV Digital Camerais a versatile and advanced point-and-shoot featuring a large 20.1-megapixel 1″ Exmor RS CMOS sensor to produce high-resolution still imagery and 4K video. 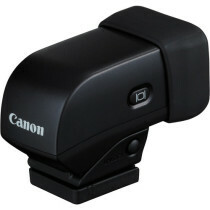 This sensor’s construction utilizes a stacked backside-illuminated design to improve clarity and image quality when working in dimly-lit conditions as well as to increase its sensitivity to a native ISO 12,800. By completely placing the camera’s photodiodes over the sensor’s processing structure, the light-gathering ability of the Exmor RS CMOS sensor is further improved over previous backside-illuminated devices and faster image processing capabilities are added as well. 16 fps of continuous shooting is made possible as well as UHD 4K movie recording with the option of Super Slow Motion frame rates of up to 960 fps. 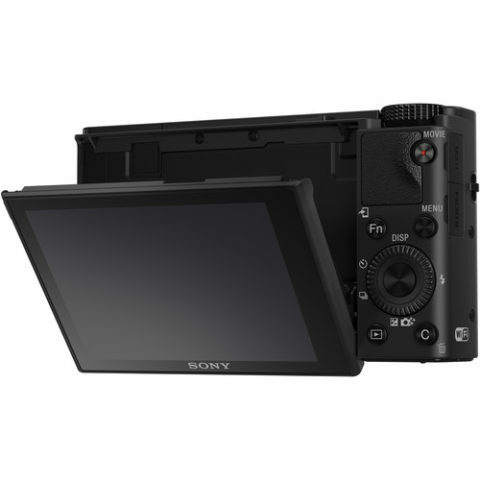 Also benefitting the performance of this sensor is the BIONZ X image processor, which helps to produce images with smooth quality and tonal gradations. 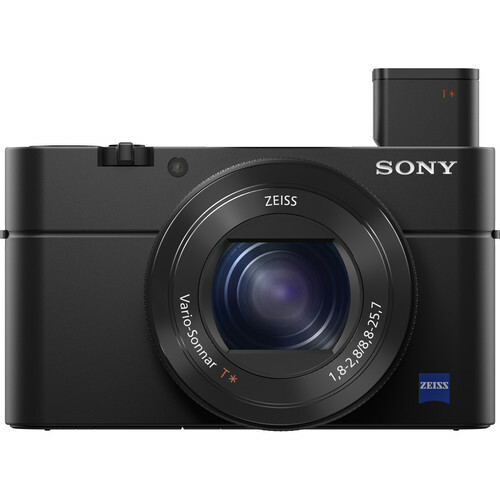 The Sony Cyber-shot DSC-RX100 IV Digital Camera’s enhanced Exmor RS CMOS sensor also helps to supplement the camera’s top mechanical shutter speed of 1/2,000. 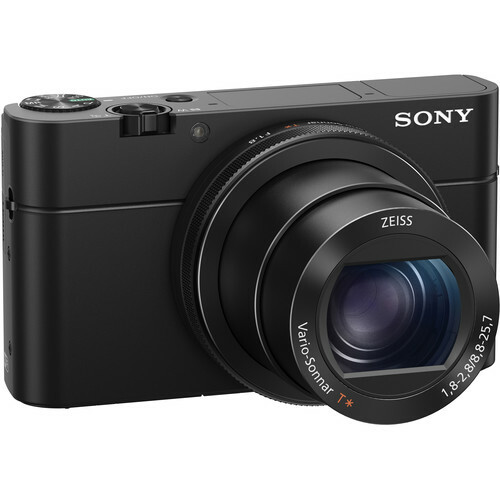 It does so by enabling electronic shutter speeds of up to 1/32,000 second which minimizes distortion caused by “rolling shutter” which can become apparent when shooting fast moving subjects. Additionally, this high-speed shutter provides the ability to shoot photos with defocused backgrounds even while using large aperture settings under very bright lighting conditions. This is achieved by a combination of the 1/32,000 second electronic shutter speed and a built-in, three-stop ND filter that allows photos to be shot under extremely bright light at a maximum of EV19 with a fully open aperture setting. 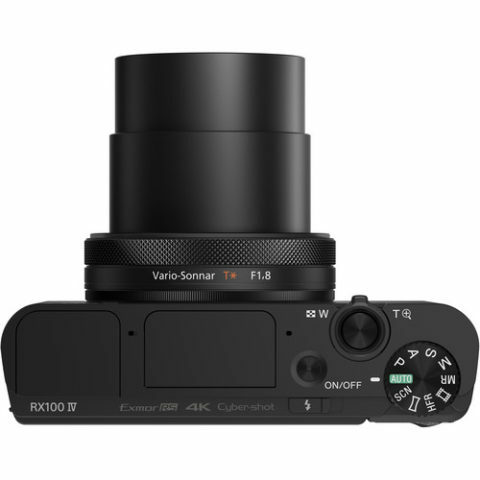 The built-in Zeiss Vario-Sonnar T* 2.9x zoom lens provides a 35mm-equivalent focal length range of 24-70mm, covering wide-angle to portrait-length perspectives to suit working in a wide variety of environments. 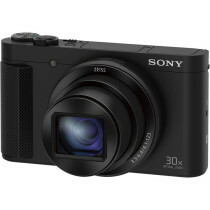 An f/1.8-2.8 maximum aperture benefits working in low lighting and controlling focus throughout the zoom range. Optical SteadyShot image stabilization is also available to help minimize the appearance of camera shake when working in dimly-lit conditions and with greater zoom magnifications. The lens also features a Zeiss T* anti-reflective coating, which helps to reduce surface reflections, lens flare, and ghosting in order to produce imagery that is rich in contrast and clarity. 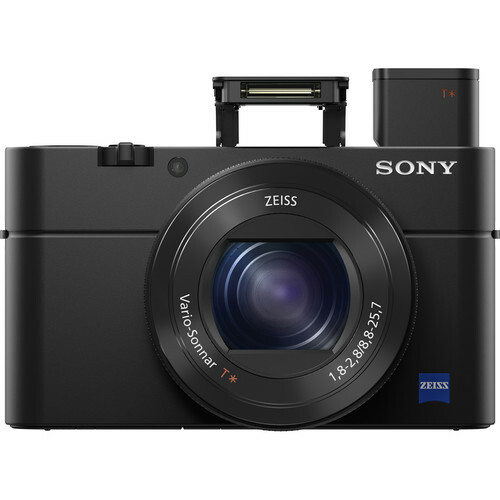 Complementing the imaging capabilities of the RX100 IV is a sleek body design featuring both an electronic viewfinder and an LCD screen. The 0.39″ 2,359k-dot SVGA OLED Tru-Finder has provides a bright, clear means for eye-level viewing. It features a unique pop-up mechanism that helps to maintain the compact form factor of the camera when carrying or if preferring to work with the rear screen. The 3.0″ 1,229k-dot Xtra Fine LCD incorporates WhiteMagic technology for easier visibility in bright conditions and its tilting design permits greater usability from high, low, and front-facing angles. 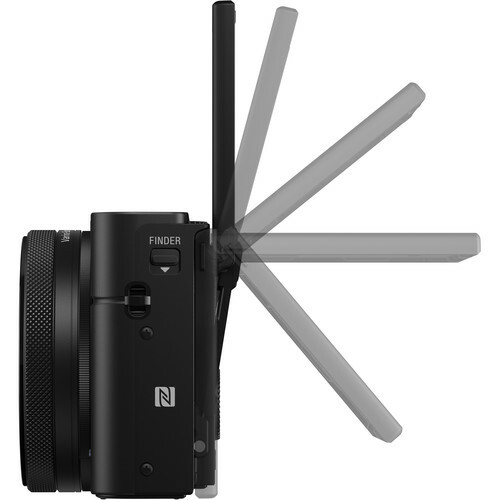 Furthermore, built-in Wi-Fi connectivity with NFC allows instant image sharing to, as well as remote camera control and monitoring from, linked mobile devices.